Mark and I arrived safely back to our home in South Dakota (USA) a week ago. We both agree that our trip to Morocco was an absolutely flawless experience. This trip may be impossible to “top!” Experience It Tours delivered 100%, in our opinion. 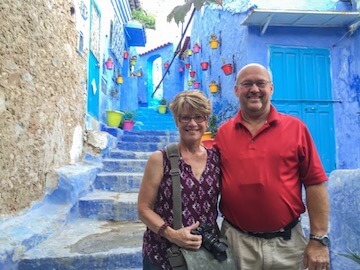 We enjoyed every stop and tried to soak up the culture and history of Morocco. It is difficult to name “highlights” because everything was such a unique experience for us, but we both agree that our trip to Erg Chebbi on the Sahara, our camel ride and overnight in the Berber Tent was definitely one of the most fun things we did. The sand dunes were an amazing landscape… beautiful, vast, and timeless. Riding our camels was such fun that we repeated the experience when we arrived on the beach at Essaouria! Our accommodations were amazing, as well. The riads were luxurious and the people who helped us were so kind and understanding of our needs. The food we were served was exceptional. After taking the cooking class (which was such fun!) in Marrakech, we plan to try some tagine dishes with our family. We truly feel that Experience It Tours helped us have the most memorable trip we’ve ever taken. From start to finish your company was professional and mindful of giving us a once-in-a-lifetime experience. Again, kudos to our driver, Driss. What a wonderful friend to accompany us around Morocco. In spite of challenging traffic in the larger cities, Driss was always completely in control of every situation. We were able to sit back and just enjoy the ride! We are enjoying telling folks here at home what an amazing trip we had…and, of course, we are giving credit for the success of our trip to Experience It Tours. Thank you so much for giving us such a completely memorable trip to the amazing country of Morocco.